You don’t need a college education to create greatness and abundance in your life. I've been told quite a few times, "Wally, I can't do XYZ because I don't have a college education." My reply is always, "That's BS and what you've been lead to believe." Colleges have become nothing more than another large corporation peddling the same information, and in many cases, outdated information, you can get from Google University, books, other more specific courses and many other resources. The only thing a college provides is a facilitator who in many cases has never applied what he/she is facilitating and a piece of paper stating that you put in your time and passed a few tests to prove you knew the information at a specific point in time. DISCLAMER - And let me make this very clear. I fully understand many vocations require certain degrees and certifications or licenses in order for you to legally work in that field of practice. Such as medical doctors and attorneys. Actually, you really only need to pass the state board or bar. But having that proof of pedigree gets you into certain "clubs". And all of that is fine. I'm not knocking that. What I do get pissed off about is the outdated mentality that you need a college education to create an amazing and abundant life for you, your family and the world. The data proves that to be so wrong. Thank about it. The Write brothers were not college educated when the change the world with flying aircraft. Henry Ford was not college educated when he changed the world, and our workout hours, with mass produced automobiles and assembly line. Mark Zuckerberg was not college educated when he created The Facebook. None of them were college educated. But make no mistake about it, they were or are very educated. Most life changing breakthroughs were not created by college educated people. They were created by men and women tinkering in their garage, kitchen, dorm room and even on the beach. Your self limiting beliefs given to you by your parents and grandparents are what's holding you back from living an abundant life. If you feel you need a better education, go get it. You do not have to spend $80k plus and four years of your life for a piece of paper (diploma). If you want to put a monetary measure to what I'm sharing with you here. 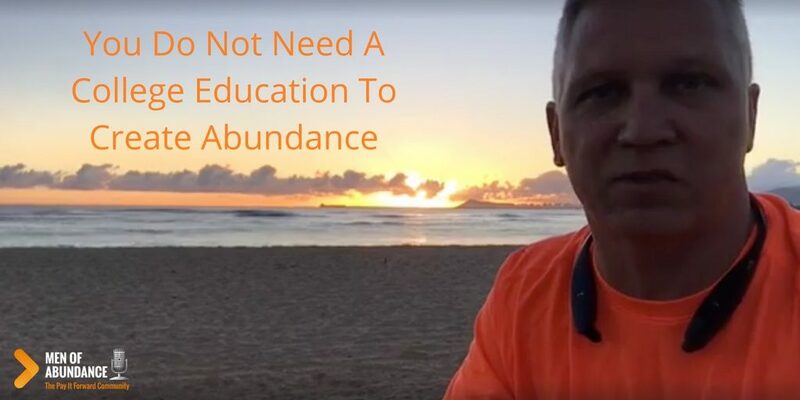 Have you ever thought about how many 6 and 7 figure income earners there are who are completely debt free compared to those with doctorate degrees who are still $50k to $100k in debt? Most people attend college to get a better paying job only to end up in massive debt with a $30k - $60k a year job. Does that make sense to you? Education is extremely important. Opportunity for a great education is all around you today. Our abundant world does not lack information. It's literally at your fingertips. There's more information on the phone in your pocket than the President of the United States had 20 years ago. President Abraham Lincoln was self taught. And that was well before the Internet, YouTube, Google, Podcasts, Audio Books, TedTalks etc. Let's bring that closer to our current time. Listen to how Scott Young got and MIT education, self taught and he did it 12 months instead of 4 years. You do not need a college education to do amazing and abundant things in your life. You certainly don't need a piece of paper telling you or anyone else your level of education or where you got it from. That's all ego talking. You do need an education. Where you get that education is up to you. My experience has shown me that the three best forms of education is doing, teaching and travel. You can do just about anything before you learn all there is to know about a task or subject. You do not master a task by learning. You master a task by doing and teaching. And travel, well travel is by far the best education you can give yourself and your family. That's for another video blog. If you don't have experience, the next best strategy is to connect with people who do. The way to do that is to read their books, take their courses, or even hire them as a coach or mentor. Great talk would like to see more videos along these lines. Programmed to believe you have to go to college so true! One of the richest guys I know does not even have a high school diploma. Aloha Michael. How are you? What’s on your mind? You got it Kyle. I get off on talking about this subject.